Now with ClimaShield™ for extra humidity protection. <br />The signature hold you love combined with new anti-humidity formula, Rave with ClimaShield™ keeps hair in place and your style in control. 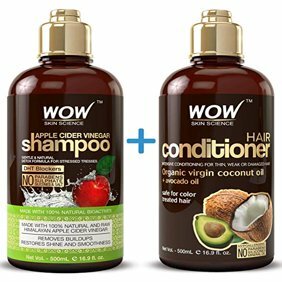 Vitamin-enhanced formula lightly conditions hair and boosts body, without being stiff or sticky. <br />Created with ClimaShield™ technology and UV blocker, Rave now not only provides durable hold you expect for both curly and straight hair but also delivers maximum performance at high humid conditions* as well as minimizes the effect of static electricity. So you can be prepared for whatever mother nature throws your way--rain or shine--in hot or cold weather. Now with ClimaShield™ for extra humidity protection. The signature hold you love combined with new anti-humidity formula, Rave with ClimaShield™ keeps hair in place and your style in control. Vitamin-enhanced formula lightly conditions hair and boosts body, without being stiff or sticky. Created with ClimaShield™ technology and UV blocker, Rave now not only provides durable hold you expect for both curly and straight hair but also delivers maximum performance at high humid conditions* as well as minimizes the effect of static electricity. So you can be prepared for whatever mother nature throws your way--rain or shine--in hot or cold weather. Ingredients: Water (Aqua), Dimethyl Ether, SD Alcohol, 40-B (Alcohol Denatured), VA/Crotonates/Vinyl Neodecanoate Copolymer, Aminomethyl Propanol, Cyclopentasiloxane, Triethyl Citrate, Sodium Benzoate, Cyclohexylamine, Masking Fragrance (Parfum), Sodium PCA, Polyurethane-14, AMP-Acrylates Copolymer, Ascorbic Acid, Tocopherol. Instructions: Shake well. Hold the can upright, 10-12 inches from hair. If dispenser clogs, remove button and rinse in warm water. 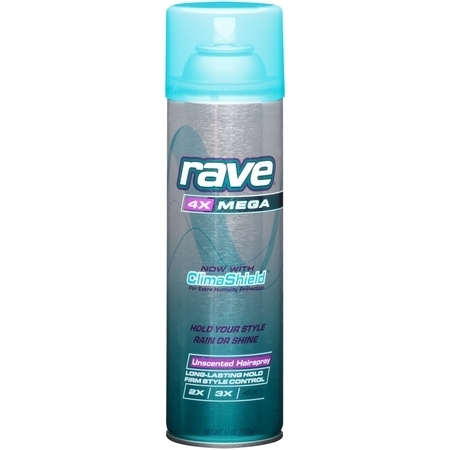 Unscented Rave 4x Mega Lives Up to the Hype! I know it sounds crazy with all the different products out there, but this is the only hairspray I've used for YEARS! I have naturally curly hair and nothing works on controlling frizz except Rave. I wish they would bring their mousse back too! I totally recommend this product. A little goes a long way. Walmart offers an excellent value on this product. Delivery was very fast. I prefer Walmart over Amazon because if you ever need to return or replace a purchase, it is so much easier with Walmart. I did not return this item, but knowing that this option is available if needed is a strong reason for purchasing from Walmart over other online sellers. I needed an inexpensive hairspray to hold my curls after using my curling iron. I did not want a spray that would make my hair hard, and this fits the bill perfectly. Best of all, I can't beat the price.